Your head turns with anticipation at the hissing sound of an opening bottle. As you hold your Chimay goblet at a 45 degree angle, your eyes are riveted by the sublime elegance of amber lights as you pour this brew from its protective bottle. As your beer climbs higher within its crystal surroundings, you bring the glass upright, where a trickling liquid forms generous clouds of creamy foam, sealing the golden liquid beneath it. Aromas radiate like a den of pleasure, where they kiss your olfactory senses and release exotic memories of karmic moods. This is where the actual “tasting” begins. It is beneficial to capture beer aroma in a glass that can deliver the enchantment of smell in a concentrated form to your olfactory sense. 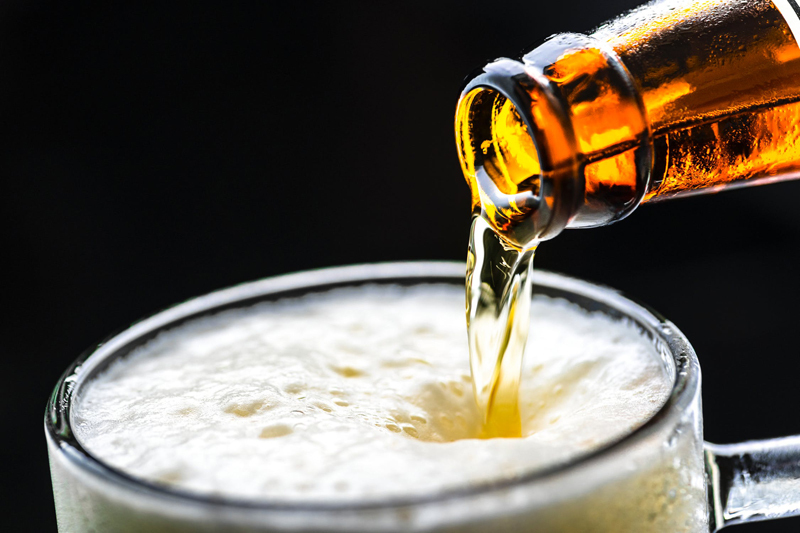 You obviously will not enjoy the nuances of a delectable brew if you drink directly from a bottle or can – this would impair your sense of smell and the ability to clearly define tastes within the beer. The initial aroma that is released during the pour is the “dominating scent.” This is often the sweet smell of malt or butterscotch, the warm scent of baked bread, or an intense, citric hop character. This is also the point of contact in which you can detect off-aromatics – the skunkiness of light-struck beer, the green apple or stale cidery smell of beer that has not had ample time to age, or the rancid, cooked-vegetable smell of a bacterial infection due to improper sanitization. The “secondary scent” emerges after the beer settles in the glass. A moderate swirl will release aromatic compounds, and you will want to sniff these compounds gently, allowing them to permeate the interior surfaces of your nose. You will begin to detect floral and spicy scents, such as chamomile, pine, coriander, pepper, juniper or wildflower. You may also become aware of fruit tones like sweet apricots, sour raspberries, dried fruit, or citric lemon and orange. Fruity profiles, when present, are among the most familiar scents to the novice taster, creating involvement on a higher plane of consciousness. As your sense of smell becomes dazzled with the delightful emergence of these bouquets, a relaxed ambience clears your head, and you begin to detect “residual scent.” This is the point at which your mind becomes open to the experience of beer tasting. Unusual aromas meld with your heightened awareness, and you become aware of the subtleties associated with classic signature brews - horse blanket, candy apple, wet grass, earthiness, licorice or nuttiness. Keeping a scoresheet is critical in your assessment of each beer. You may wish to keep a leather bound “tasting book” as a record of each beer you experience. Keep details of your discoveries within each category, and score each section to get an overall impression of the beer you are evaluating. Content copyright © 2018 by Carolyn Smagalski. All rights reserved. This content was written by Carolyn Smagalski. If you wish to use this content in any manner, you need written permission. Contact Carolyn Smagalski for details.